Happy Sunday everyone! I was able to make a few cards yesterday, thanks to the cold and misty weather. I made a coffee themed card. 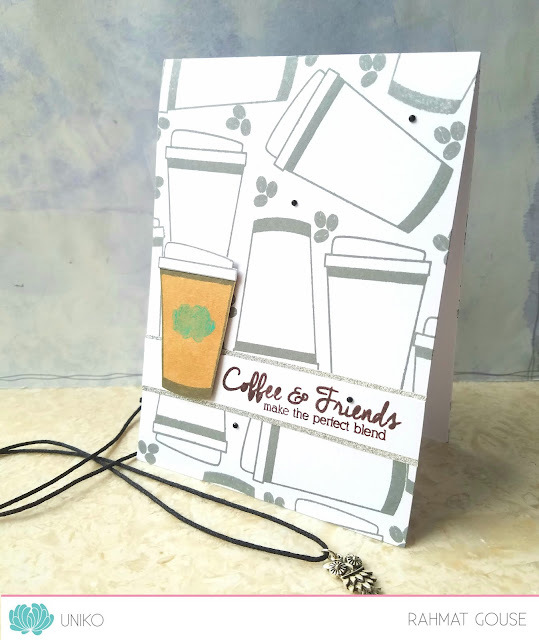 I used Uniko coffee stamps here, and used Lawn Fawn Hippo ink to stamp the outlined cup and beans in the background! I stamped another cup on a kraft card stock and fussy cut, and used white for the lid! The sentiment is stamped in black on a white strip, and I used a silver glitter paper to edge it both ends. A few black jewels to finish off. This is a super cool coffee card. 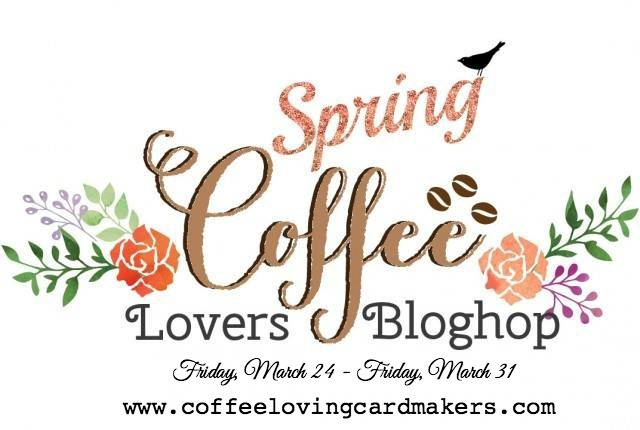 Thanks for sharing it with us all in the Coffee Loving Card Makers Spring Blog Hop. Have a blessed week. This is beautiful. Love the random stamping. Lovely design - love your BG! Love the layout you used on your card! Fabulous! I love this...such a modern design. I just love your bold background! Super card. Thank you for playing along with Addicted To Stamps and More. Hope to see you again at our new challenge! Such a cool background.. love it! A fun card! Thanks for sharing with us at Aud Sentiments and hope to see you again soon.